5 51 Be the first to write a review! Barack Obama Collecting and growing Chia Pet pottery planters has become an American tradition. Everybody loves Chia Pets! Kids and grown ups alike will enjoy "watching them grow!". Full growth in 1-2 weeks. What better than to celebrate our political process than with a Chia Head! Chia Handmade Decorative Planter- Freedom of Choice Series- Barack Obama Collecting and growing Chia Pet pottery planters has become an American tradition. 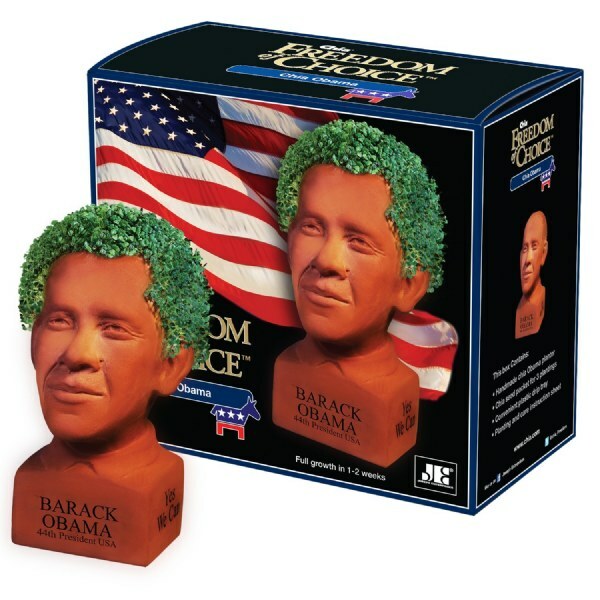 What better than to celebrate our political process than with a Chia Head! Hail to the Ch-Ch-Ch- Chief! Make your political statement...in chia! Everybody loves Chia Pets! Kids and grown ups alike will enjoy "watching them grow!". Full growth in 1-2 weeks. Chia Pets are easy to grow making them a perfect first plant growing experience for kids. Makes a great gift! Collect them all! No customers have left a written review of this product yet. You can be the first to write one!